What the heck is a Rotator Cuff? Today I’ll take a detour from the series of posts about types of massage to talk about something I think many people wonder about: that foggy mystery of the rotator cuff! 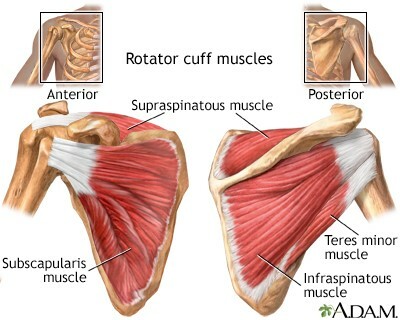 Often mispronounced as “rotor cup” or “rotary cup,” the rotator cuff remains a vague image in the minds of many. So, let us take a few minutes to demystify this! You will find that the more you understand this vital area of your upper body, the more power you will have to recover from injury or, more importantly, to prevent injury in the first place. In my experience with clients, I find most people think the rotator cuff is a covering of some sort for the shoulder. While this is true in a way, it’s not usually as they imagine. The rotator cuff is actually a group of four muscles that are involved in (wait for it) rotating the shoulder… and it has an elevating part to it as well. These four muscles are as follows: the Supraspinatus, the Infraspinatus, the Teres minor, and Subscapularis. These relatively small muscles attach at the head of the humorous (top of the arm at the shoulder) creating, if you will, a “cuff.” The muscle bodies themselves attach wholly onto the scapula (shoulder blade). Take a look at the picture below. Let’s quickly look into the movements in which these individual muscles assist. The Supraspinatus assists with abduction of the arm at the shoulder; in other words, it helps raise the arm out to the side of the body. This is generally the most injured muscle because it passes under the arch formed by the scapula shoulder blade) and the clavicle (collar bone). When it does this, it can rub and create irritation or tears. Next we will look at the infraspinatus and the Teres minor. These two muscles help in lateral rotation(rolling the arm out) of the arm at the shoulder. Finally, we have the Subscapularis. It is a broad flat muscle that is a powerful internal rotator. On many people, this muscle becomes shortened, limiting the ability of full lateral rotation and eventually causing injury. Now that you know a little more about the rotator cuff you might wonder why this is so important. Well, I believe that knowledge is power! Moreover, depending on which actual muscle you may have injured, it will change what should be done for rehabilitation. Knowing this information could be beneficial for those who work at a job with repetitive shoulder movements. You can start to understand which rotator cuff muscles are being over-used and get some exercises to re-balance these muscles and prevent a possibly debilitating injury. I hope this helps clear some of the fog away from the rotator cuff!